Let's keep the food photography going, shall we? I learned a lot about myself and how I shoot through the process of entering that juried exhibition, and I made a promise to myself that each week I'd be on the look out for something beautiful at the market and bring it home to photograph. A little weekly push to get my eye trained to be on the look out. Well, how could I pass up this beautiful purple asparagus? Purple! Asparagus! Well. I had fun. We love roasted asparagus (Face it, we love asparagus any way you slice it. ), but for this gorgeous stuff, I wanted something special. 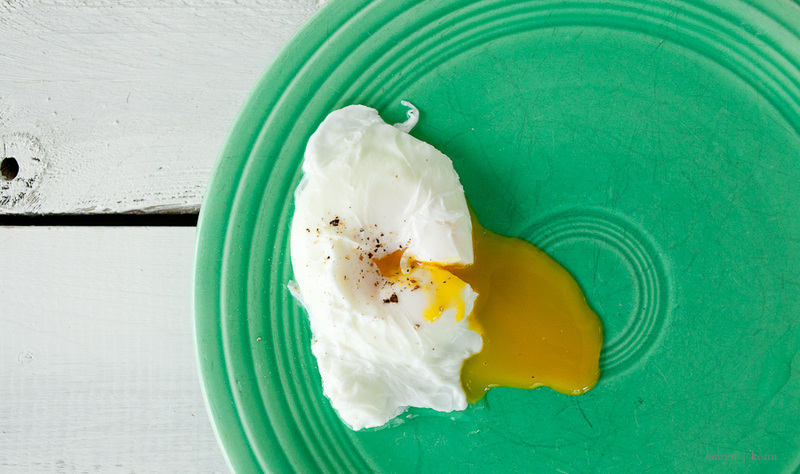 Enter the poached egg. The only problem? I've never poached an egg. I know, I know. Sounds silly, but everything I've heard about it is how tricky the process is, and I was intimidated. So I read a few recipes and looked at a couple of videos (there a quite the varying opinions regarding technique, it seems), and finally, with Cal standing by for moral support, I got brave and just did a trial run. The recipe/technique I used was this one. And you know what? It turned out okay! We were astonished. Since he's allergic to raw or undercooked eggs, poor Cal couldn't even reap the reward, but he was still thrilled! We did it again for dinner that night, and things turned out just as tasty. You've roasted asparagus, right? That part's super easy. Just break or chop off the tough ends, toss them on a cookie sheet with some olive oil and some salt and pop them in the oven (maybe 400º-425º ?) for 30 minutes or so. I just keep an eye on them, really. When they soften and brown a bit, they're ready. Put an egg on them and they're something else entirely. Something pretty special. After I took that last shot, I added some balsamic glaze, and that was pretty special too.